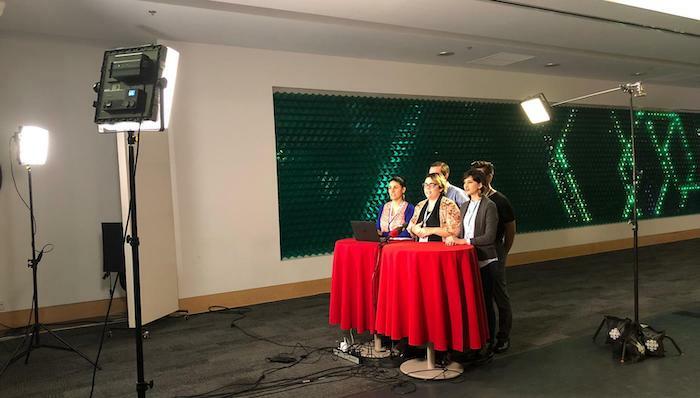 The CBC hosted their annual hackathon at the beginning of February, which was focused around the theme of content personalization, with an aim at improving relationships with their audiences. Back in December, three teams from MDM Cohort 13 submitted their proposals and two were selected to participate in the hackathon. Team Cohort 13 (David Sigrist, Wayland Bang, Dafne Delgado, Qhazal Jenab, and Emma Konrad) pitched the idea of a personalized archival experience. 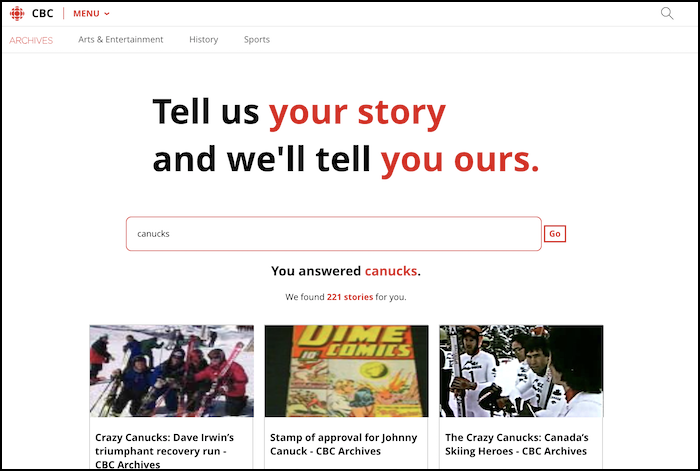 By integrating a landing page into CBC’s existing website, we could ask people questions about their life experiences – where were they born, when were they born, what was the first concert they saw – and draw up relevant archival footage and content based on their experiences. Team CDM C13 (Kevin Du, Anna Xuan, Meghan Ang, and Gabriel Reis) pitched a catered mobile experience, which provided users with select articles based on their goals and routine. Users could input their interests – working out, business, arts and cultures, etc. – and the app would provide them with pertinent articles. This blog post will focus on the experiences of Team Cohort 13, who developed a supplement to the CBC website that allowed visitors to search the digital archives based on their personal experiences. We arrived at the CBC office on Friday evening and within a few hours had settled on our game plan. We had already pitched our idea so some of the hard work was already done. Instead, we jumped right into it. Our developers began poking around in CBC’s website and we were able to get a sense of how long the project would take. We set up goals, roles, and a schedule, then we all buckled down and started to work individually. We left at decent hour (which can be a rarity in events such as these) and got a good night’s sleep. Prototype of the team's project. Saturday was our first and only full day to work on our idea. We met up at the CBC offices early that morning and, to our surprise and delight, got a comprehensive tour of the offices. We were able to see where the television, radio, and print magic happened, and get a better understanding of who we were building for. Then, we got to work (fuelled by coffee and donuts, of course). David and Wayland worked on the backend, looking for ways to search through the CBC’s archives and return the appropriate results. Qhazal tackled the UX for the project and Dafne took her ideas and turned them into reality. Meanwhile, I worked on the pitch we would have to deliver–live on television–for the next morning. It was a busy day and, while our developers may have "developed" a few gray hairs as they tackled the problems, everything went relatively smoothly. We departed for the night with optimism and only a few small worries. Sunday morning was hectic. When we all arrived at the CBC, we had a working backend and a beautiful front end, but they weren’t hooked up. While our developers worked on that, I rehearsed for the pitch. Finally, with minutes to spare, we had a product to show the judges. We headed down to the filming area and awaited our turn to pitch. It was nerve-wracking, to say the least. When we entered the hackathon, we were prepared to deliver a product on a tight deadline. What we didn’t anticipate was the pressure of a live recording; the lights, the camera, the microphones–they all come together to create an experience that is quite different than pitching in person. But we rallied. Both teams made it through their pitches to the judges (who were split between Toronto and Montreal) and were able to answer all the questions put to us. Students on set at CBC pitching their project. While neither team walked away with a trophy, we learned so much from this experience. It was incredibly rewarding to take a problem put forth by the CBC and come up with a way to solve it in less than 48 hours. Jams and hackathons like this teach us that we are more capable than we know, that we don’t need polished, perfect products to convey an idea, and that constantly challenging ourselves makes us better at our jobs. That’s what we learn here at the CDM and it’s fantastic to see it so easily applied to real-world experience. I know all the team members walked away with excitement, eager to tackle the next hackathon. Jams and hackathons like this teach us that we are more capable than we know, that we don’t need polished, perfect products to convey an idea, and that constantly challenging ourselves makes us better at our jobs. That’s what we learn here at the CDM and it’s fantastic to see it so easily applied to real-world experience."